OPERATION ON TARGET was an official Varsity Scout high adventure activity until the Varsity Scouting program was discontinued on 1-Jan-2018. However the On Target event still lives on and is open to Scouts or anyone interested in participating. It is still scheduled annually for the 3rd Saturday in July &/or September (Arizona & New Mexico hold their Operation On Target event on the 3rd Saturday in September and southern California participates in both July and September. Anyone interested in participating in this event will choose mountains (or other elevated places) to climb. From there they use mirrors to signal each other. They talk to each other with ham radios or cell phones. They plot these contacts on a map and keep a listing of the peaks that have confirmed their flashes. OPERATION ON TARGET provides your Scout Troop or group with an activity as easy and relaxing as setting mirrors up in a park or a parking lot (with a bucket of chicken for lunch) to signal the nearby mountain tops - or as strenuous as a week-long wilderness excursion to reach a mountain peak no one has ever signaled from before, topped off with a Sunday worship service in God's great outdoors. ON TARGET is remarkably flexible. It can be tailored to fit every teams needs, resources, and demands. OPERATION ON TARGET can be as difficult or as effortless as you and your group make it. You can drive, ride an elevator to the top of a tall building, walk, hike, ride mountain bikes, ride horses, do a technical climb with ropes, or rent a helicopter to get to your chosen site. OPERATION ON TARGET is: Advancement, Service, Special Programs & Events, High Adventure, and Personal Development. It fits all or part of 37 different merit badges. Service project opportunities abound (i.e. cleaning or improving the trail to your peak, camp area, planting trees, or some other forest service recommended project). Make a movie or slide show. ON TARGET is high adventure, and finally, no one can participate without developing personally. 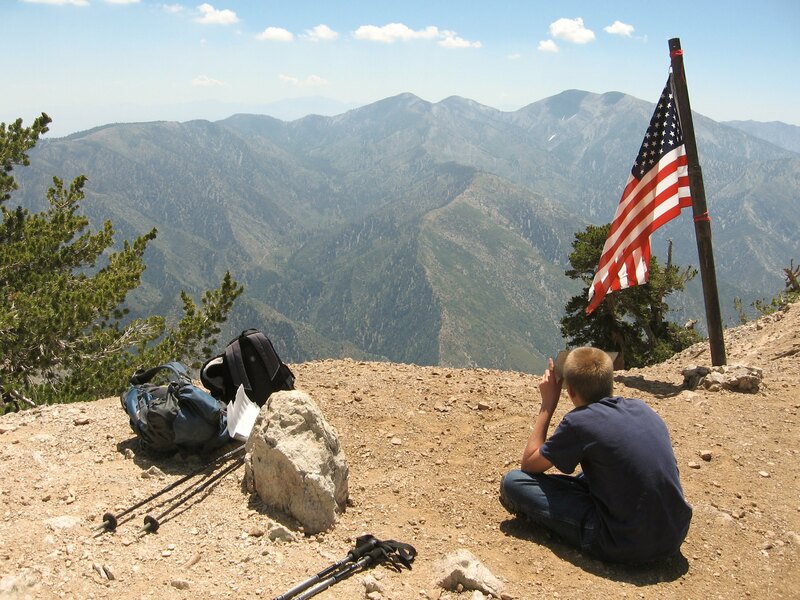 OPERATION ON TARGET is setting a distance record for signaling between 2 peaks (the current Sept. 2012 Varsity record is 179.9 miles between Hayden Peak AZ and San Gorgonio Peak CA) or perhaps surpassing the 1988 border to border record for Scout units signaling from near the Canadian border to near the Mexican border in a chain of mirror flashes from peak to peak (see the Border to Border & the Pacific to Denver page). OPERATION ON TARGET is excitement! Everyone jumps up and down when they make the first contacts with another team or parents & friends "down in the valley." OPERATION ON TARGET is distinctive, expandable, limitless. It provides group members a chance to prove themselves with individual struggles, insights, and growths. OPERATION ON TARGET is about being "On Target with using the Scout program, On Target in life individually, and On Target on the peak". On Target offers rewards not for sale anywhere at any price - "making it to the top" - staying "focused" and "on target"- "reaching out"- "being there for someone else"- " letting your light shine" Use your imagination, there are many more. OPERATION ON TARGET is the worlds biggest video game! It is FUN, FUN, FUN! And it's FREE!